Less power but full Warwick tone. Warwick's aspiration is to be a one stop source of what you need to be a bass player. If you don't need to bend peoples eardrums but you want to be heard while playing with others, the top tier units of our new BC combo series, the BC150 and BC300 combos, will serve you with distinction. Either in the rehearsal room at home or on a small stage, as a personal monitor or even at large venues when a wall of amp stacks seems a bit too much, these combos will do the trick. Both boast a 15-inch Bass Driver and adjustable compressors, along with the standard features available on all the BC combos. There are a few key differences between the two as well as separating them from the rest of the BC range. The BC150 includes a sweepable mid in its 3 band equalizer to ramp up the 150 watts of power inside. The BC300 moves us firmly into bass head territory though, adding the 10 band equalizer, bass/treble controls and all the other features which can be found on the WA300. It also has a cabinet that is deeper both sonically and physically and, of course, a more powerful speaker driver. Last but not least it has our fabulous new HF bullet. The award-winning Hellborg series of amps have been both the inspiration and source of circuitry for these beauties. Warwick cares for the young. Aspiring musicians starting out on their journey into music need quality instruments to retain their enthusiasm and passion. Warwick's RockBass is one example of this. Now we have the new BC series: real pro sound in a compact, affordable package. BC 20, BC 40 and BC80 are not just for the beginner but also an excellent series of practice amps for the seasoned professional. We've packed as many features as we could squeeze into their chunky frames. Each has a purpose designed 8, 10 and 12-inch bass driver respectively and a high frequency horn. BC 20 and 40 comes with a 3 band equalizer, automatic compressor, passive and active inputs, auxiliary input for your music player of choice and headphone connection to make sure you don't annoy your neighbours. The bass reflex cabinet is generously sized to guarantee a flawless speaker system that can deliver plenty of lows, even for your cherished 5 and 6-string. The BC80 packs a little more punch with a 4 band EQ and a fully adjustable compressor and, of course, as the size increases, the bass descends. 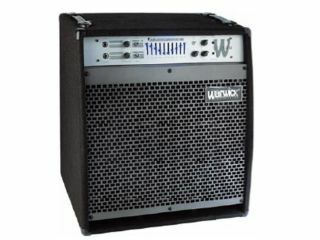 Most importantly, the circuitry powering these amplifiers is based on principles already applied in Warwick's successful Hellborg range of professional amplifiers. All speaker drivers are custom designed. Even the 20W BC20 has a high frequency horn for a truly impressive sound.